The Key colour for Spring and it isn’t what you would expect. Spring usually evokes shades of vibrant pastel hues; greens, blues, pinks and yellows. However Spring 2015 is proving to be different. Time to purge your wardrobe of its colour, this Spring it’s all about white. Here is our pick of the top 6 Designer White pieces to splurge on this Spring. 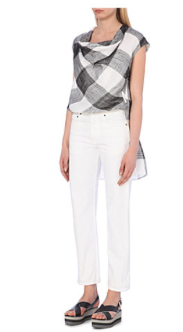 A great transitional piece that can take you from day to night, work to social. 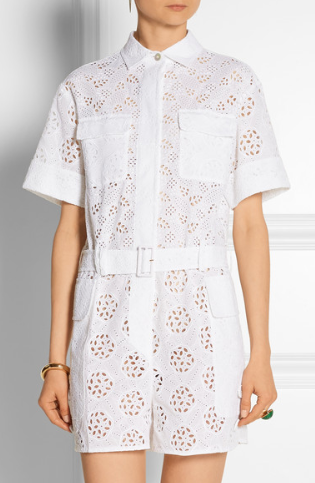 A stunning cotton belted playsuit the perfect accompaniment for your spring/summer evening soirees. With its unusual grid pattern and short hem beneath the main shape of the skirt, this Erdem piece makes a statement. 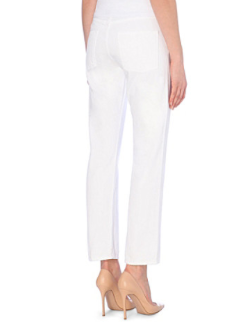 A daring off white jumpsuit with sheer silk panels, an interesting alternative to the LBD. This flared sleeved cotton crop top is great to keep you cool whilst looking chic. 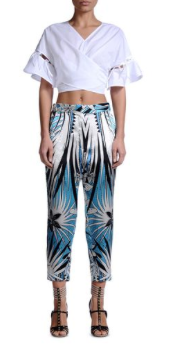 Pair with some flared white trousers to complete the look. For those who dare to wear white jeans, these boyfriend style ACNE jeans will add both style and comfort to your Spring look.